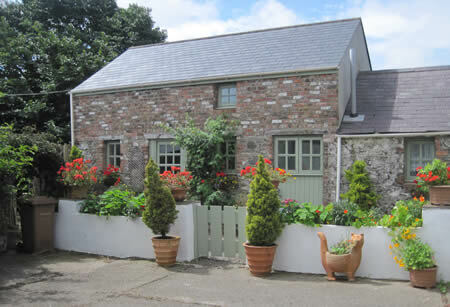 Welcome to Ballavarteen Holiday Cottage – a little gem in an exquisite rural setting. Enjoy quality accommodation fully furnished and equipped with top of the range modern conveniences and perfectly situated for a relaxed break. Stay for a weekend, a short mid week break or treat yourself and your family to a longer holiday on this rural working Manx farm. Our cottage is situated in an idyllic location yet only a 5 minute drive to the busy fishing port of Ramsey with its quaint harbour, shops and restaurants. Other amenities include a bowling alley, swimming pool and the lovely Mooragh Park with its boating lake and play park for the children. The vintage Manx Electric Railway runs from Ramsey to Douglas travelling through the beautiful Manx countryside and enjoying stunning coastal views. At Laxey passengers can change onto the Snaefell Mountain Railway for a trip to the summit. The converted interior of the original detached cow barn and dairy has been updated with taste and flair into a private 2 bedroomed cottage offering guests the best possible comfort in all seasons. When you want to curl up, cosy and warm, indoors there's a satellite TV and DVD player in the comfortably furnished lounge for your relaxation and entertainment. Wi-Fi is available for those with computers. From the inner hall there are two steps up to a double bedroom and there are twin beds in the second bedroom. On sunny days, the sheltered south facing paved patio leading off the lounge/diner area with its gorgeous vista of the surrounding countryside is ideal for lazy days or alfresco meals in complete seclusion. There is plenty of space in the bright open plan and up to date kitchen for food preparation and cooking and all the superior branded appliances and equipment necessary are provided including dishwasher, washer/drier, built in microwave and electric oven and hob. To receive a booking form and brochure by post please click here. Fantastic cottage, wonderful location. To arrive to homemade bread, cakes and muffins and fresh eggs was a delight. None of us wanted to leave. The boys will miss the animals, especially the sheep. Thank you Joyce & John - will come back soon. Irvin, Lynne, Cameron & Ross. Birchington-on-Sea. To arrive and find groceries and home baking was greatly appreciated. We have felt well looked after. Thank you for all your kindness we have loved every minute of our two weeks here. See you next year. John & Sue, Rutland. We've had a fantastic time, lots of sandcastles, ice-creams & railways. The cottage is absolutely lovely. Thank you so much. We will be recommending you to all our friends. Brad, Wendy, Emily & Joe, Preston. What a fantastic cottage. Nice touch to have welcome groceries and the scones were lovely. Tracey & Rich, Flintshire. The perfect retreat with the perfect hostess. A warm welcome when we arrived along with home baking. The cottage is well equipped and cosy. Norma, John & David, Kirkliston, Scotland. A lovely warm & comfortable cottage. We really enjoyed our stay. Joyce not only baked us mince pies, Xmas Cake etc but there was also a Christmas tree. Thank you - we hope to come back again Jim, Sue & Vicky, Pinner, Middlesex. Thank you for another wonderful holiday. You think of everything and more. Can't wait to be here again in August Geoff Lynne & Scott, Northumberland.